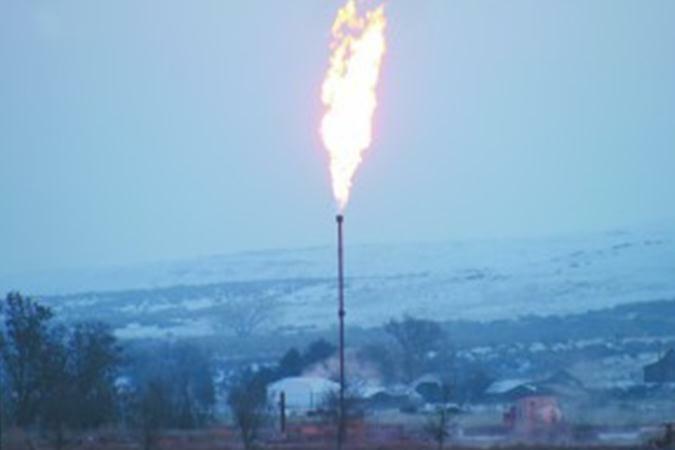 Natural gas is burned off at a test well on Friday morning, January 4, 2013, just outside New Plymouth (Argus Observer/Cherise Kaechele photo). People looking or driving northeast of New Plymouth or east of Payette need not be concerned about fire they are seeing, as the flames are the result of natural gas well testing, the latest step in an effort to begin getting production started in Payette County. Richard Brown, CEO of Snake River Oil and Gas, said the testing will go on for two to three weeks. Snake River Oil and Gas, in partnership with Alta Mesa Holdings, purchased the assets of Bridge Resources last year, including 11 wells, seven of which have production capability, Brown said. Three of the wells are now under intensive testing, which will help company officials understand the size of the reservoir and will be indicative of the production of the other four wells, Brown said. Idaho’s next chapter of drilling for natural gas has begun. The Observer’s Larry Meyer reports that Snake River Oil and Gas has launched “intensive testing” at three wells, to help determine production viability. The testing is expected to last two to three weeks. Snake River, in partnership with Alta Mesa Holdings, purchased a number of wells from Bridge Resources in 2012, after the Canadian-based company liquidated many of its assets, in the wake of financial troubles at the height of its 2011 drilling operations. Snake River is currently testing wells purchased from Bridge Resources. No new wells have been drilled. In early May 2012, police arrested 13 concerned British Colombia residents along with scientists, when they blocked four Wyoming coal export trains (350.org photo). As the environmental impact statement (EIS) scoping period for the proposed Gateway Pacific Terminal at Cherry Point, Washington, draws to a close on January 21, and public comments on the Coyote Island Terminal in Boardman, Oregon, are long past due, federal, state, and county decision makers never provided public hearings in Idaho and Montana or a mine-to-port regional programmatic environmental analysis. 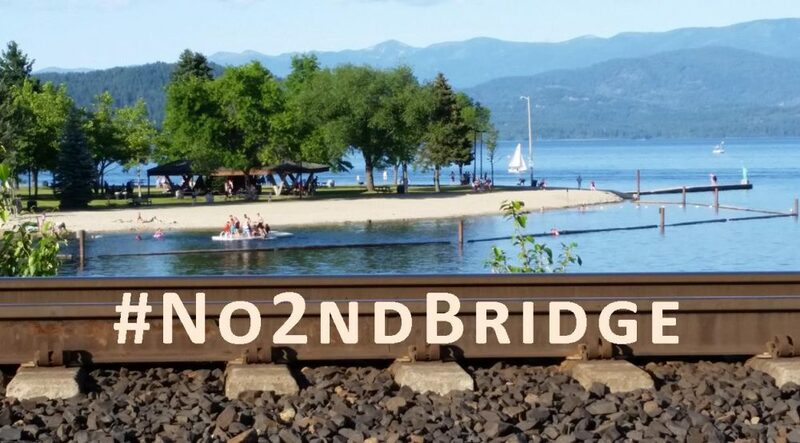 Nonetheless, residents of the comparatively rural inland Northwest, especially near Powder River Basin coal strip mines and train routes through Montana population centers and along the railroad funnel between Sandpoint, Idaho, and Spokane, Washington, will bear most of the adverse risks and consequences of domestic coal export to Asia, while Ambre Energy, Arch Coal, Peabody Energy, SSA Marine, and other giant coal companies reap billions of dollars in profit on up to 160 million tons of coal per year, at taxpayers’ expense. Pillaged public investments would support the required infrastructure and mitigate the predictable damages of this corporate onslaught. Each of the 40 to 60 additional coal trains per day, 1.5 miles long with their 125 cars, would spew toxic coal dust, diesel fumes, occasionally derailed loads, and incessant noise, disrupt local transportation, businesses, emergency responses, and economies, and degrade air and water quality, human and wildlife health, property values, and regional identity. Five proposed West Coast and Columbia River terminals with huge, open-air coal heaps, river barges through endangered species critical habitat, and over 950 immense, ocean-going, coal ships per year, crowding oil tankers through the tangled Salish Sea to Asian markets for combustion, would further compromise aquatic ecosystems and inhabitants and significantly exacerbate pollution and global climate change.